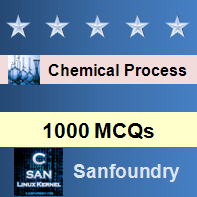 This set of Chemical Process Calculation Multiple Choice Questions & Answers (MCQs) focuses on “Heat Capacity”. Explanation: The amount of heat required to raise the temperature of the unit mass of gas through one degree at constant volume is Cv. Explanation: The amount of heat required to raise the temperature of the unit mass of gas through one degree at constant pressure is Cv. 3. Which one of correct relation ? Explanation: Cp = R + Cv. Explanation: The heat capacity depends on whether the heat is added at constant Pressure or constant Volume. 5. measurement of Cp is _______ than Cv. Explanation: Heat capacity measurements at constant volume are dangerous because the container can explode. Explanation: For a mono atomic gas Cv = 1.5 R.
Explanation: For a diatomic gas Cv = 2.5 R.
Explanation: For an ideal gas: Cp = Cv + R.
9. Consider He gas an ideal gas, What is Cv for He? 10. Consider N2 gas an ideal gas, What is Cv for N2?